Hi there! The outstanding Cassini mission ended last September with its Grand Finale, and it gave us invaluable data, which will still be studied for many years. Today I present you a study which has recently been published in The Astrophysical Journal: Particles co-orbital to Janus and Epimetheus: A firefly planetary ring, by a Brazilian team composed of Othon C. Winter, Alexandre P.S. Souza, Rafael Sfair, Silvia M. Giuliatti Winter, Daniela C. Mourão, and Dietmar W. Foryta. This study tells us how the authors characterized a dusty ring in the system of Saturn, studied its stability, and investigated its origin. 60,268 km The atmospheric pressure of Saturn reaches 1 bar. This is considered as the equatorial radius of Saturn. The A and B Rings are the densest ones. They are separated by the Cassini Division, which appears as a lack of material. It actually contains some, arranged as ringlets, but they are very faint. The Encke Gap is a depletion of material as well, in which the small satellite Pan confines the boundaries. Here we are interested in a dusty ring enshrouding the orbits of Janus and Epimetheus, i.e. outside the dense rings. The discovery of this ring had been announced in 2006, this study reveals its characteristics. The two coorbital satellites Janus and Epimetheus are a unique case in the Solar System, since these are two bodies with roughly the same size (diameters: ~180 and ~120 km, respectively), which share the same orbit around Saturn. More precisely, they both orbit Saturn in 16 hours, i.e. at the same mean orbital frequency. This is a case of 1:1 mean-motion resonance, involving peculiar mutual gravitational interactions, which prevent them from colliding. They swap their orbits every four years, i.e. the innermost of the two satellites becoming the outermost. The amplitudes of these swaps (26 km for Janus and 95 for Epimetheus) have permitted to know accurately the mass ratio between them, which is 3.56, Janus being the heaviest one. Interestingly, Epimetheus is the first among the satellites of Saturn for which longitudinal librations have been detected. As many natural satellites, Janus and Epimetheus have a synchronous rotation, showing the same face to a fictitious observer at the surface of Saturn. For Epimetheus, large librations have been detected around this direction, which are a consequence of its elongated shape, and could reveal some mass inhomogeneities, maybe due to variations of porosity, and/or to its pretty irregular shape. So, Cassini images have revealed a dusty ring in that zone. To characterize it, the authors have first extracted images likely to contain it. Such images are made publicly available on NASA’s Planetary Data System. Since that ring had been announced to have been observed on Sept 15th 2006 (see the original press release), the authors restricted to 2 days before and after that date. The data they used were acquired by the ISS (Imaging Science Subsystem) instrument of Cassini, more precisely the NAC and WAC (Narrow- and Wide-Angle-Camera). They finally found 17 images showing the ring. The images are given as raw data. The authors needed to calibrate their luminosity with a tool (a software) provided by the Cassini team, and sometimes to smooth them, to remove cosmic rays. Moreover, they needed to consider the position of the spacecraft, to be able to precisely locate the structures they would see. It appears that the ring presents no longitudinal brightness variation. In other words, not only this is a whole ring and not just an arc, but no density variation is obvious. However, it presents radial brightness variations, over a width of 7,500 km, which is wider than the 5,000 km announced in the 2006 press release. The next step is to understand the dynamics of this ring, i.e. its stability, its origin, the properties of the particles constituting it… Let us start with the stability. The authors ran N-body simulations, i.e. numerical integrations of the equations ruling the motion of a ring particle, which would be gravitationally perturbed by the surrounding bodies, i.e. Saturn, and the Janus, Epimetheus, Mimas, Enceladus, Tethys, Dione, and Titan. Moreover, for a reason that I will tell you at the end of this article, the authors knew that the particles were smaller than 13 μm. The motions of such small particles are affected by the radiation pressure of the Sun, in other words the Solar light pushes the particles outward. The authors simulated 14 times the motion of 18,000 particles equally distributed in the rings. Why 14 times? To consider different particle sizes, i.e. one set with 100 μm-sized particles, and the other sets with sizes varying from 1μm to 13μm. And it appears that these particles collide with something in a few decades, mostly Janus or Epimetheus. This leaves two possibilities: either we were very lucky to be able to take images of the ring while it existed, or a process constantly feeds the ring. The latter option is the most probable one. Let us now discuss this feeding process. The likeliest sources of material for the rings are ejecta from Janus and Epimetheus. The question is: how were these ejecta produced? By impacts, probably. This study show that Janus and Epimetheus are impacted by the particles constituting the rings, but the impact velocities would not permit to produce ejecta. This is why the authors propose a model, in which interplanetary particles collide with the satellites, generating ejecta. And let us finish with something funny: the ring seems to behave like a firefly, i.e. sometimes bright, and sometimes dark, which means undetectable while present. To understand what happens, figure out how the light would cross a cloud of particles. If the cloud is dense enough, then it would reflect the light, and not be crossed. But for dust, the light would be refracted, i.e. change its direction. This depends on the incidence angle of the Solar light, i.e. on the geometrical configuration of the Sun-Saturn-ring system. The Solar incidence angle is also called phase. 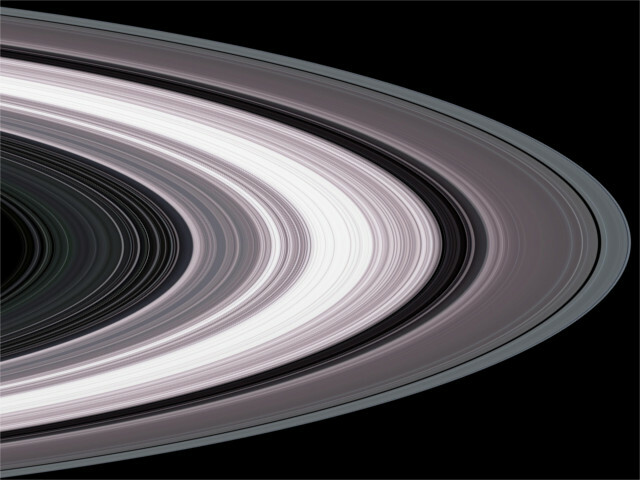 And this phase changes with the orbit of Saturn, which results in huge brightness variations of the ring. Sometimes it can be detected, but most of the time it cannot. This can be explained and numerically estimated by the Mie theory, which gives the diffusion of light by small particles. This theory also explains the creation of rainbows, the Solar light being diffracted by droplets of water. and the one of Dietmar William Foryta. Hi there! Today: a new post on the rings of Saturn. I will more specifically discuss the F Ring, in presenting you the study A simple model for the location of Saturn’s F ring, by Luis Benet and Àngel Jorba, which has recently been accepted for publication in Icarus. The F Ring of Saturn is a narrow ring of particles. It orbits close to the Roche limit, which is the limit below which the satellites are not supposed to accrete because the differential gravitational action of Saturn on different parts of it prevents it. This is also the theoretical limit of the existence of the rings. Its mean distance from the center of Saturn is 140,180 km, and its extent is some hundreds of kilometers. It is composed of a core ring, which width is some 50 km, and some particles which seem to be ejected in spiral strands. Orbiting nearby are the two satellites Prometheus (inside) and Pandora (outside), which proximity involves strong gravitational perturbations, even if they are small. The images of the F Ring, and in particular of its structures, are sometimes seen as an example of observed chaos in the Solar System. This motivates many planetary scientists to investigate its dynamics. Imagine a planar configuration, in which we have a big planet (Saturn), a small particle orbiting around (the rings are composed of particles), and a third body which is very large with respect to the particle, but very small with respect to the planet (a satellite). The orbit of the particle is essentially an ellipse (Keplerian motion), but is also perturbed by the gravitational action of the satellite. This usually results in oscillating, periodic variations of its orbital elements, in particular the semimajor axis… except in some specific configurations: the mean motion resonances. When the orbital periods of the particle and of the satellite are commensurate, i.e. when you can write the ratio of their orbital frequencies as a fraction of integers, then you have part of the gravitational action of the satellite on the particle which accumulates during the orbital history of the two bodies, instead of cancelling out. In such a case, you have a resonant interaction, which usually produces the most interesting effects in planetary systems. the longitude of the pericentre of the satellite ϖs. The situation is a little more complicated when the orbits are not planar, please allow me to dismiss that question for this post. You have a mean-motion resonance when you can write <pλp-(p+q)λs+q1ϖp+q2ϖs>=0, <> meaning on average. p, q, q1 and q2 are integer coefficients verifying q1+q2=q. The sum of the integer coefficients present in the resonant argument is null. This rule is sometimes called d’Alembert rule, and is justified by the fact that you do not change the physics of a system if you change the reference frame in which you describe it. The only way to preserve the resonant argument from a rotation of an angle α and axis z is that the sum of the coefficients is null. In the first case, pλp-(p+1)λs+ϖp is the argument of a Lindblad resonance, which pumps the eccentricity of the particle, while pλp-(p+1)λs+ϖs is a corotation resonance, which is doped by the eccentricity of the satellite. Here I supposed a positive q, which means that the orbit of the satellite is exterior to the one of the particle. This is the case for the configurations F Ring – Pandora and F Ring – Titan. However, when the satellite is interior to the particle, like in the configuration F Ring Prometheus, then the argument of the Lindblad resonance should read pλs-(p+1)λp+ϖp, and the one of the corotation resonance is pλs-(p+1)λp+ϖs. As I said, these resonances have cumulative effects on the orbits. This means that we could expect that something happens, this something being possibly anything: a Lindblad resonance should pump the eccentricity of a particle and favor its ejection, but this also means that particle which would orbit nearby without being affected by the resonance would be more stable… chaotic effects might happen, which would be favored by the accumulation of resonances, the consideration of higher-order ones, the presence of several perturbers… This is basically what is observed in the F Ring. The authors address this problem in running intensive numerical simulations of the behavior of the particles under the gravitational action of Saturn and some satellites. Let me specify that, usually, the rings are seen as clouds of interacting particles. They interact in colliding. In that specific study, the collisions are neglected. This allows the authors to simulate the trajectory of any individual particle, considered as independent of the other ones. They considered that the particles are perturbed by the oblateness of Saturn expanded until the order 2 (actually this has been measured with a good accuracy until the order 6), Prometheus, Pandora, and Titan. Why these bodies? Because they wanted to consider the most significant ones on the dynamics of the F Ring. When you model so many particles (2.5 millions) over such a long time span (10,000 years), you are limited by the computation time. A way to reduce it is to remove negligible effects. Prometheus and Pandora are the two closest ones and Titan the largest one. The authors have detected that Titan slightly shifts the location of the resonances. However, they admit that they did not test the influence of Mimas, which is the closest of the mid-sized satellites, and which is known for having a strong influence on the main rings. A critical point when you run numerical integrations, especially over long durations, is the accuracy, because you do not want to propagate errors. The authors use a symplectic scheme, based on a Hamiltonian formulation, i.e. on the conservation of the total energy, which can be expanded up to the order 28. The conservation of the total energy makes sense as long as the dissipation is neglected, which is the case here. The internal accuracy of the integrator was set to 10-21, which translated into a relative error on the angular momentum of Titan below 2.10-14 throughout the whole integration. It might be tough to determine from a numerical integration whether a particle has a stable orbit or not. If you simulate its ejection, then you know, but if you do not see its ejection, you have to decide from the simulated trajectory whether the particle will be ejected one day or not, and possibly when. For this, two kinds of indicator exists in the literature. The first kind addresses the chaos, or most specifically the hyperbolicity of the trajectory, while the second one addresses the variability of the fundamental frequencies of the system. From a rigorous mathematical point of view, these two notions are different. Anyway, the ensuing indicators are convenient ways to characterize non-periodic trajectories, and their use are commonly accepted as indicators of stability. A hyperbolic point is an unstable equilibrium. For instance a rigid pendulum has a stable equilibrium down (when you perturb it, it will return down), but an unstable one up (it stays up until you perturb it). The up position is hyperbolic, while the down one is elliptic. The hyperbolicity of a trajectory implies a significant dependency on the initial conditions of the system: a slightly different initial position or different initial velocity will give you a very different trajectory. In systems having some complexity, this strongly suggests a chaotic behavior. The hyperbolicity can be measured with Lyapunov exponents. Different definitions of these exponents exist in the literature, but the idea is to measure the evolution of the norm of the vector which is tangent to the trajectory. Is this norm has an exponential growth, then you strongly depend on the initial conditions, i.e. you are hyperbolic, i.e. you are likely chaotic. Some indicators of stability are thus based on the evolution of the tangent vector. The other way to estimate the stability is to focus on the fundamental frequencies of the trajectory. Each of the two angles which characterize the trajectory of the particle, i.e. its mean longitude λp and the longitude of its pericentre ϖp can be associated with a frequency of the problem. It is actually a little more complicated than just a time derivative of the relevant angle, because in that case you would have a contribution of the dynamics of the satellite. A more proper determination is made with a frequency analysis of the orbital elements, kind of Fourier. You are very stable when these frequencies do not drift with time. Here, the authors used first the relative variations of the orbital frequency as indicator of the stability. The most stable particles are the ones which present the smallest relative variations. In order to speed up the calculations, they also used the variations of the semimajor axis as an indicator, and considered that a particle was stable when the variations were smaller than 1.5 km. A study of stability necessarily focuses on the core of the rings, because the spiral strands are supposed to be doomed. And the authors get very confined zones of stability. A comparison between these zones of stability shows that several mean-motion resonances with Prometheus, Pandora and Titan are associated with them. This could be seen as consistent with the global aspect of the F Ring, but neither with the measured width of the core ring, nor with its exact location. This problem emphasizes the difficulty to get accurate results with such a complex system. The study manages, with a simplified system of an oblate Saturn and 3 satellites, to render the qualitative dynamics of the F Ring, but this is not accurate enough to predict the future of the observed structures. The study, also made freely available by the authors on arXiv. Thanks to them for sharing! The web page of Luis Benet (UNAM, Mexico). The web page of Àngel Jorba (University of Barcelona, Spain). Thanks for having read all this. I wish you a Merry Christmas, and please feel free to share and comment! Hi there! Today I will tell you about the detection of a ringlet in the rings of Saturn, by Matthew Hedman and Brian Carter, at the University of Idaho (USA). This ringlet presents an interesting dynamics, this is why it caught my attention. Such a discovery is made possible thanks to the Cassini-Huygens space mission, which orbits Saturn since 2004. Cassini-Huygens is a joint mission of the NASA, the ESA, and the Italian Space Agency ISA. It consists of a spacecraft, Cassini, which orbits Saturn since 2004, and a probe, Huygens, which landed and died on Titan in January 2005. This mission Cassini-Huygens is one of the most ambitious ever made, this is why it required an American-European collaboration. It has given us, and is still giving, invaluable information on the system of Saturn. For instance, it permitted the expected discovery of a global subsurface ocean for Titan, and a more surprising one for Enceladus,. Mimas may also have one, from the measurements of its rotation, and that would be even more surprising. Before Cassini-Huygens, we thought that the system of Saturn was a kind of old, frozen and boring world, while it is actually pretty recent, and even the mid-sized icy satellites may present complex interiors. 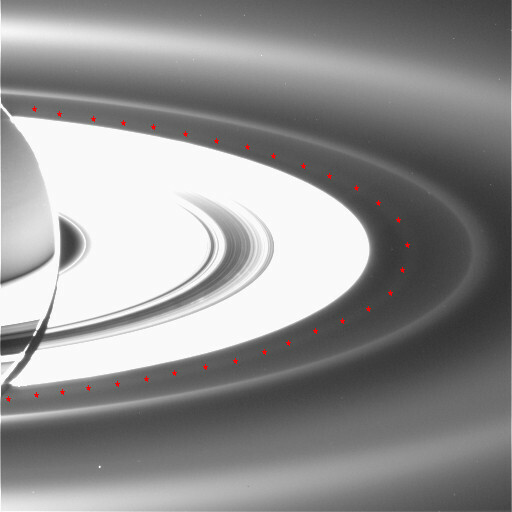 As a consequence, this pushed some of our colleagues to propose new scenarios of formation of the satellites of Saturn, either as droplets composed of ring material which would have migrated outward, or as remnants of larger progenitors, which were impacted. These are just examples, and I cannot give an exhaustive list of discoveries due to Cassini-Huygens. We have now images of the surface of Titan, we have in situ measurements of its winds, we know the satellites and the planet Saturn much better… Let us focus on the rings. It is known whether a ring is faint or dense from its optical density, which is then associated with an estimated surface density of the ring, seen as a flat structure. Here, I have mixed the main structures of the rings with fainter ones, which are more relevant in this study. I have particularly emphasized the new ringlet, which discovery is presented in this study. A ringlet is a kind of narrow ring of dusty material, i.e. small particles, their radius being something between the centimeter and the meter. Discovering a new ring is challenging because it is very faint. Here, it was discovered on images of the Narrow Angle Camera (NAC) of the Imaging Science Subsystem of the Cassini spacecraft. To make its presence obvious, it is necessary to use images which are not saturated, to remove the background luminosity, and to equalize the response of the different pixels constituting the image (flat-fielding). For this study, the authors used mostly images taken between 2012 and 2014, but some in 2006 as well. The authors find that this ring is an ellipse with a small eccentricity (0.0012), which precesses. This means that this ellipse is not fixed, but moves around Saturn, while the particles constituting the ringlet move much faster, on the ellipse. Their orbital period is pretty the same as Prometheus’, i.e. some 15 hours, but surprisingly the precession period of the ellipse is longer, i.e. 133 days, against 130 for Prometheus, and is very close to the one of the F Ring. This is pretty unexpected for the following reason: in an ideal (keplerian) problem, i.e. a point-mass planet around which orbits a particle, the orbit does not precess. The precession is due to departures from this problem, mostly the polar flattening of Saturn, but also the gravitational perturbation of the other satellites. It can be easily shown that, if you get closer to Saturn, you precess faster. Here, the ringlet precesses slower than Prometheus while its orbit is inside. The authors have an elegant explanation, in showing convincingly that the collisions between the particles can synchronize the precession of this ringlet with the one of the F ring, providing that this ringlet is faint enough. I admit that I had not heard of this mechanism before, but the authors convince me. I would have a priori suspected the gravitational interaction of Pandora, but its precession is even slower than the measured one. There is at least one another example of synchronization of the precessions in the system of Saturn: Titan is so massive that it forces the precession of the orbit of Rhea. The authors also mention the possibility that the particles of this new ringlet are affected by a co-orbital mean-motion resonance with Prometheus. I choose to focus on the synchronization of the precession with the F Ring, since I consider this is the most exciting result of the study. This would be the first accurate measurement of this collision-assisted synchronization, and we can expect in the future many other examples of this mechanism. The study, accepted for publication in Icarus, and made freely available on arXiV by the authors, many thanks for sharing! That’s all folks! Please, don’t hesitate to leave a comment!